Aptly set out to solve these challenges by innovating around a solution that everyone already uses daily: the inbox. Everyone knows how to use email, so Aptly supercharges your inbox with tools to make property teams communicate better, stay organized and deliver better service. The result: happy residents that stay in their homes longer. 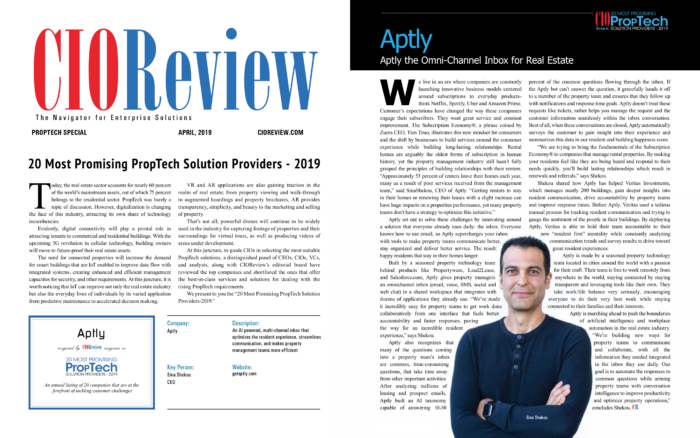 Built by a seasoned property technology team behind products like Propertyware, Lead2Lease, and Salesforce.com, Aptly gives property managers an omnichannel inbox (email, voice, SMS, social and web chat) in a shared workspace that integrates with dozens of applications they already use. “We’ve made it incredibly easy for property teams to get work done collaboratively from one interface that fuels better accountability and faster responses, paving the way for an incredible resident experience,” says Shekou. Aptly also recognizes that many of the questions coming into a property team’s inbox are common, time-consuming questions, that take time away from other important activities. After analyzing millions of leasing and prospect emails, Aptly built an AI taxonomy capable of answering 10-30% of the common questions flowing through the inbox. If the Aptly bot can’t answer the question, it gracefully hands it off to a member of the property team and ensures that they follow up with notifications and response time goals. Aptly doesn’t treat these requests like tickets, rather helps you manage the request and the customer information seamlessly within the inbox conversation. Best of all, when these conversations are closed, Aptly automatically surveys the customer to gain insight into their experience and summarizes this data in our resident and building happiness score. “We are trying to bring the fundamentals of the Subscription Economy® to companies that manage rental properties. By making your residents feel like they are being heard and respond to their needs quickly, you’ll build lasting relationships which result in renewals and referrals,” says Shekou. Shekou shared how Aptly has helped Veritas Investments, which manages nearly 200 buildings, gain deeper insights into resident communication, drive accountability by property teams and improve response times. Before Aptly, Veritas used a tedious manual process for tracking resident communication and trying to gauge the sentiment of the people in their buildings. By deploying Aptly, Veritas is able to hold their team accountable to their new “resident first” mentality while constantly analyzing communication trends and survey results to drive toward great resident experiences. Aptly is made by a seasoned property technology team located in cities around the world with a passion for their craft. Their team is free to work remotely from anywhere in the world, staying connected by staying transparent and leveraging tools like their own. They take work/life balance very seriously, encouraging everyone to do their very best work while staying connected to their families and their interests. 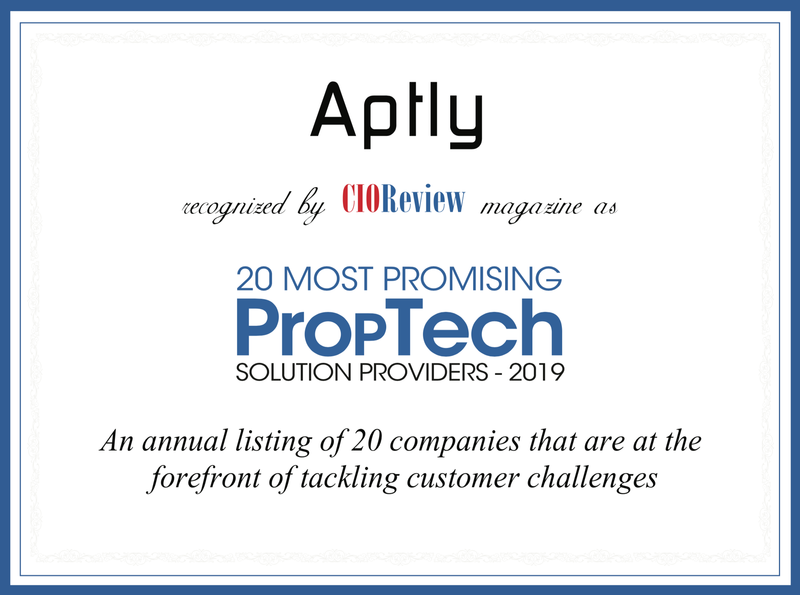 Aptly is marching ahead to push the boundaries of artificial intelligence and workplace automation in the real estate industry. “We’re building new ways for property teams to communicate and collaborate, with all the information they needed integrated in the inbox they use daily. Our goal is to automate the responses to common questions while arming property teams with conversation intelligence to improve productivity and optimize property operations,” concludes Shekou.